​We welcome you to “my Aura” Finishing School - One of the Top Finishing School In India, first of its kind in Ahmedabad; a unique place for individuals of all the age groups; to help them transform and make their dreams come true while climbing the ladder of success. Life is a school of live experiences and none of us would agree on that we are perfect and have nothing more to learn. 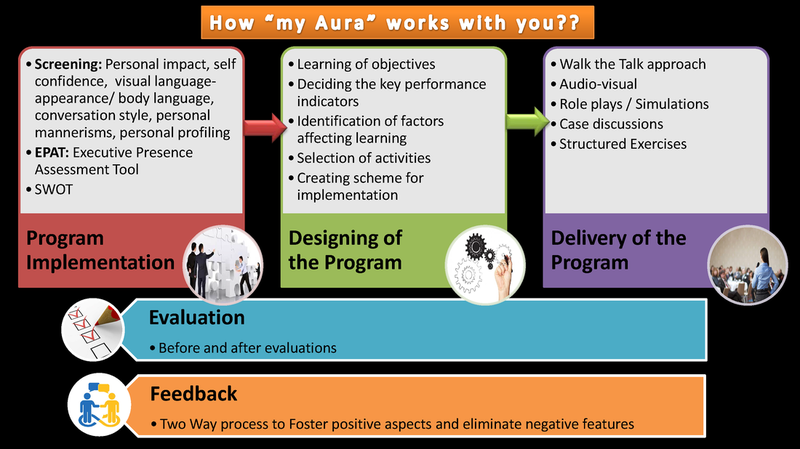 ‘my Aura’ finishing school makes you learn what schools never taught you. So it’s back to school for grownups and second school for children; leading to finer learning, social grace, etiquette, manners, cross cultural protocols, soft skills to present your best to the outside world. 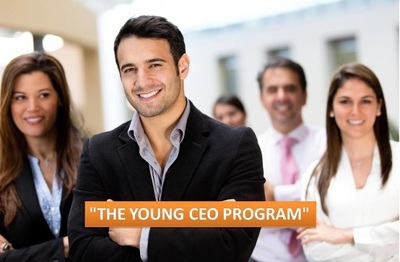 We are proud to tell that since our inception, we have been consistently helping, guiding, mentoring, training, grooming and coaching Executives, Business people, Entrepreneurs, Government Officers, College Students , Ladies, Teenagers and those who have been searching for a unique self identity to stand out in the crowd and create a niche for themselves in their professional and personal sphere. Your elegance needs a statement, poise, style and attention; ‘my Aura’ finishing school promises one of its kind of experience to you to provide a complete 360 degree inner and outer transformation; making you stylish, confident, visible, different, happy and progressive to get noticed. What is a finishing school? 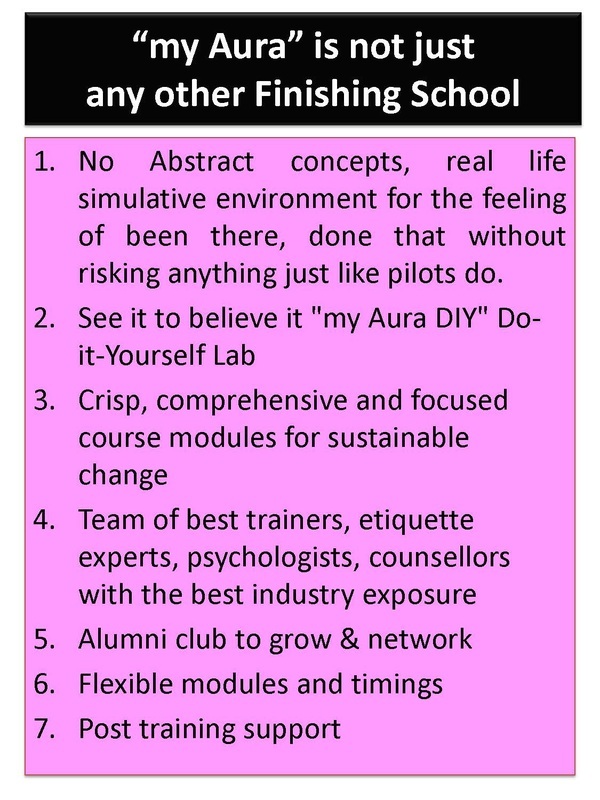 why 'my aura' finishing school? ​As there is a sharp societal transition of women from home to board room and cut throat competition for men with advent of corporate culture and globalization; sustaining success in this rapidly changing environment demands a sophisticated professional who knows how to distinguish himself or herself from the competition, develop , network and multiply business, project a power image, confidence and authority along with working in the multicultural environment. The academic degree equips an individual for future career but focus little on honing and refinement of other life and social skills which are equally or more important for successful performance and positive impact. 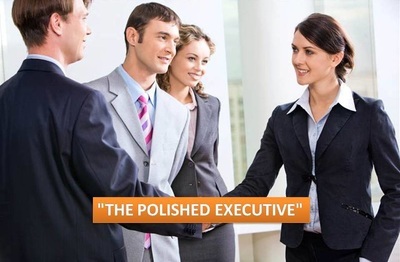 Rules of etiquette and protocol are critical to success in social and corporate settings. Finishing school help bridge the gaps and help individuals adapt to the competition, fast pace globalization with ease and finesse. "One must learn by doing the thing, for though you think you know it, you have no certainty, until you try"
Our success depends on our attention to the needs of our clients which truly help them achieve - we don't succeed unless our clients succeed. Courses and programs offered are comprehensive, practical, simple helps in confidence building, image enhancement, reputation management, professional development of an individual and organizations. We take a unique and innovative approach to guide our clients using ‘Hands on approach’ i.e. do and learn. 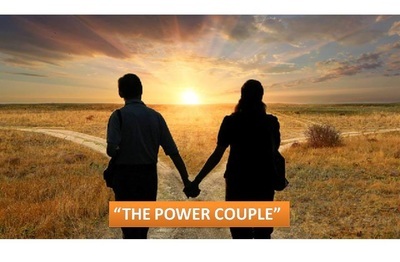 Through personalized and focused training methodologies our clients develop the tools they need for ongoing success in their respective fields. Curriculum is interactive with high level of personal active involvement. 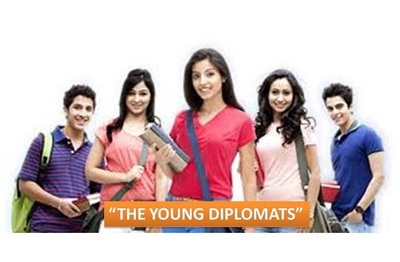 If you are looking for Finishing School For Girls or Adults or Best Finishing School In Ahmedabad then your Search ends Here!